It is a supreme irony that genealogists in general assume that they could never find anything useful for their family history in the records of one particular court. • Because of the requirement in the U.S. Constitution that federal courts can only hear cases and controversies1 — meaning real disputes that affect real people, there is always a back-story to a Supreme Court case. It’s always going to matter, deeply, to the individual people and families involved. • Because it’s the highest court in the United States, the decisions of the Supreme Court widely affect people’s lives and may very well help explain why an ancestor did what the ancestor did when the ancestor did it. 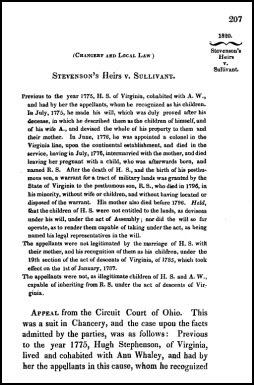 Consider, for example, the case of Stevenson’s Heirs v. Sullivant, decided by the High Court in 1820.2 It’s a case about bounty land, issued for Revolutionary War service, and the legal issues the Court had to confront dealt with the rights of the soldier’s children to the land granted for their father’s service. • Hugh Stephenson and Ann Whaley lived together and had a bunch of kids before July 1775. • Hugh and Ann didn’t marry until July 1776. • Hugh died in the Revolutionary War in August 1776. • When Hugh died, Ann was pregnant with a son who was born after his father’s death and was named Richard. • Ann died before 1796. • Richard died in 1796, without leaving a wife or child, and was still a minor when he died. • Hugh had a brother named John. There’s a lot more, of course. We know that at least some of the children Hugh and Ann had before 1775 were still alive in 1820, taking their fight for the bounty land all the way to the Supreme Court. We know that Hugh left a will naming the children (William, John, Magnus, Hugh, Nancy and Betty4) that was “duly proved” after his death.5 We know that the land, and the land fight, was in Ohio.6 We know that John Stephenson, Hugh’s brother, had disposed of his interest in the land to the respondent in the case, Sullivant. All from one paragraph of the decision. Clearly, anyone with any ties to the Stevenson family, or to the Sullivant family, wants to know about Stevenson’s Heirs v. Sullivant. But there’s much more to this case that might affect so many other families. Think maybe that might have affected family dynamics in a few situations? Caused a falling out among older and younger children, perhaps? Driven an illegitimate child to enmity with legitimate siblings? Driven that illegitimate child to strike out on his own? Now maybe nobody in your family ever had an illegitimate child and maybe you don’t descend from one. In that case, maybe you don’t need to think about this case when you’re trying to understand the reasons behind some of your ancestors’ actions. For the rest of us — and for The Legal Genealogist in particular9 — it would be a supreme irony not to consider how a decision like this might have affected what our ancestors did, when they did it — and why. I have my own US Supreme Court case in the family history, Rankin v State of Tennessee, 78 US 380 (1870). The Library of Congress had the original case file in its records (see http://jonesandrelated.blogspot.com/2013/12/supreme-court-case-file-of-rankin-v.html). There is so much detail here, in the earlier Tennessee Supreme Court record, Civil War files and in related news articles from the day that at some point I could write a book on the whole thing. If you find one of these cases in your own family history there is definitely a wealth of information to go through. Outstanding, Patrick! And, of course, with any court case we find in a published format (which includes a lot of appeals court cases), we should always do what you did and go for the case file itself. That’s where the rest of the story will be found! Years ago I stumbled on a Supreme Court Case, Hannay v. Eve 7 U.S. 242 where my 4th great-grandfather was the defendant. Once I tracked down the exhibits and paperwork at NARA, it opened my eyes to the realities of his occupation (mariner) and to his personality. That led to more in the NC Colonial Records, some newspaper ads that added to the story and other equally colorful information. The case didn’t provide any family names or dates, but the insight I gained to his thought processes and actions was invaluable. Personality is hard to identify in most of the records we find. This court case was a big eye-opener. A perfect example of the kinds of goodies you can get in court records, Patricia! Thanks for sharing it.